Home Outdoors Beaches How to Upgrade Your Pup’s Dog Park Experience in L.A.
How to Upgrade Your Pup’s Dog Park Experience in L.A.
Dog parks don’t have to be synonymous with a patch of dusty earth confined within a depressing chain-link fence—although a quick survey of Los Angeles’s pooch-friendly playgrounds might have you thinking otherwise. 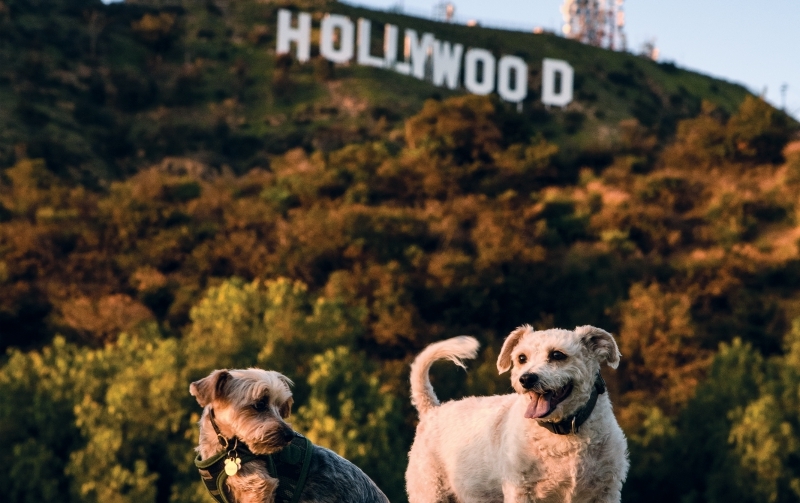 Consider a real estate upgrade by taking your buddy to Lake Hollywood Park, a grassy oasis situated nearly 500 feet above the city (and within perfect-picture range of the Hollywood Sign). The unexpected expanse of green is a draw, thanks to its impressive views of the skyline and the Hollywood Reservoir—even the ocean on clear days. Chances are you’ll see a lot of dogs joyfully zooming across the field, unfettered by a leash, but follow suit at your own risk: The whole no-leash thing technically isn’t allowed, and city park rangers have been known to ticket. If you’ve got a dog who’s more partial to hiking trails than open fields, keep it classic with a visit to nearby Runyon Canyon, the only legal off-leash trail in L.A. Head east for even more options: Ernest E. Debs Regional Park offers an extensive network of broad trails for people and pups, while the 5.8-mile Beaudry Loop in the southern Verdugo Mountains provides a solid workout and stunning panoramas of the city. Almost the entirety of the larger, more rugged San Gabriel Mountains is open to on-leash dogs, too—the 5.9 miles out and back to Henninger Flats, right above popular Eaton Canyon in Pasadena,will take you up the front range to a shaded picnic and campground area. The sprawling trail system in Big Santa Anita Canyon has a variety of hikes for people and canines of various abilities, not to mention year-round water and cover from the sun (a welcome respite in the hot summer months). As for wave-runners, there’s Long Beach’s Rosie’s Dog Beach, the county’s sole slice of sand that doesn’t require you to pack a lead. Spend a few hours romping in the surf, then hightail it to nearby Gallagher’s Pub & Grill, where you can kick back with a stuffed cheeseburger and a brew on the outdoor patio (just make sure to toss a tater tot or ten under the table for your doggo).